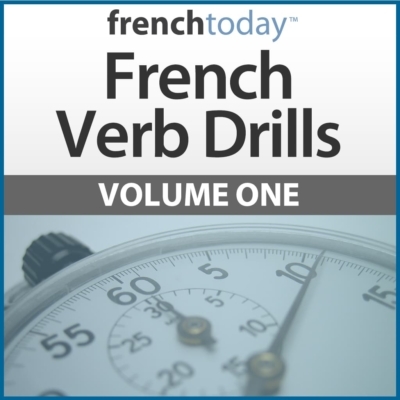 French Verb Drills professionally recorded and specifically created to help you master your French verb conjugation & modern French pronunciation. With so many different French verb conjugations, it’s really hard to come up with the correct verb form in a conversation. Because these drills are based on repetitions and a large practical exercise section, you’ll build up reflexes and never hesitate again when looking for a verb form. Train Out of Order - Not Always From "Je" To "Ils"! One of the problems with existing verb exercises is that they always teach conjugations in the same order: from “je” to “ils”. Then, when students need to come up with a verb in the “vous” form, they have to go through the whole list! The exercise section of these drills will test you at random, just like it will happen in a real conversation. Spoken and written French are worlds apart (more so than any other language). These drills will teach you today’s modern glided pronunciation of key French verbs - the way they are spoken today. This is essential to understand French people when they speak, and for them to understand you as well. 103 drills + 6 minutes per drill + 241 page transcript + 100% money back guarantee = incredible value. Includes the most common French tenses and moods: Indicatif présent, passé-composé, imparfait, futur, futur antérieur, plus-que-parfait, passé simple. Conditionnel présent. Présent du Subjonctif. In the affirmative, negative and interrogative forms. Drill Sample "Etre futur de l'indicatif - forme interrogative"
Drill Sample "S'asseoir Présent de l'indicafif - forme affirmative"
I am much more comfortable speaking now that my verbs come to me more quickly and naturally. The drills give you practice in random order and that has been enormously helpful. Great product. 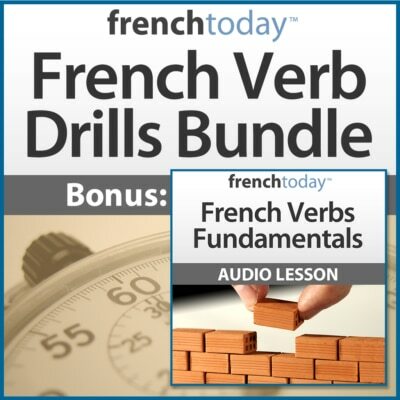 Buy all three volumes together and get the popular "French Verb Fundamentals" Audiobook for free! A $39.99 Value! 100% Money Back Guaranteed for 120 days! Try it for 4 full months, if it doesn’t improve your French, we’ll refund you 100%. Avoir and Être are the 2 most important verbs in French, not only because of their meanings, but also because they are called “auxiliary” verbs: they are used to form tenses such as passé-composé, plus-que-parfait, futur antérieur, past conditional…. for all other verbs. Since they both start with vowels, there are important glidings and liaisons that are often missed by students (who tend to know the way they are spelled but not the correct modern pronunciation). Chanter is a great example of the conjugation of the regular ER verbs (also called verbs of the 1st group). 90% off French verbs follow this logic of conjugation, about 5000 verbs in total. Only “aller” ends in ER in the infinitive and is irregular. Finir is a great example of the conjugation of the regular IR verbs (also called verbs of the 2nd group). About 300 French verbs follow this logic of conjugation. For s’asseoir, I wanted to conjugate a reflexive verb starting with a vowel to help you train on the glidings and liaisons happening with the pronouns. Furthermore, “asseoir” is a verb most students have a very hard time pronouncing, just because it looks so weird when it is written. So I killed 2 birds with one stone. The other 7 verbs (aller, faire, vouloir, devoir, prendre, mettre and boire) are some of the most common French irregular verbs, and the ones I have noticed students make the most mistakes with. These are really helping me to be able speak French and not think about what to say and then speak French. I have even noticed that after two weeks, my listening comprehension has improved significantly. I listened to all three regularly, and it made a big difference in my ability to speak. Excellent products. Worth every penny. These are terrific exercises! Even though I knew most of the tenses, I feel like these solidified my knowledge and the foundation of the french language and find this to be an invaluable resource!